The cucumber harvest has been splendid this summer and oh my those fresh crispy cukes are so good. We’ve been preparing them a lot of different ways, but have topped them all with fresh refrigerator dill pickles. About as easy and quick to make as anything can be, the simple ingredients combine to create a symphony of flavor. And CRUNCHY? These pickles define the word. So, here are the ingredients. A batch of four pints mixes up in just minutes. Really. Then let them “stew” in your refrigerator for two days and voila! Pickles the likes of which you’ve never tasted, unless of course you regularly make refrigerator dills. No cooking. The sweet pickles are just as easy — only quicker — ready to enjoy in eight hours. Cucumbers never tasted so good. These pickles are quick. They’re easy and best of all — so good. Slice cucumbers down their length and then slice each half down its length to create “spears.” Place one dill head and two cloves garlic in bottom of each of four pint jars. Start slipping cucumber spears into jars, filling jars as tightly packed as possible without crushing spears. Mix together the salt, sugar, vinegar and water, stirring until sugar and salt are dissolved. 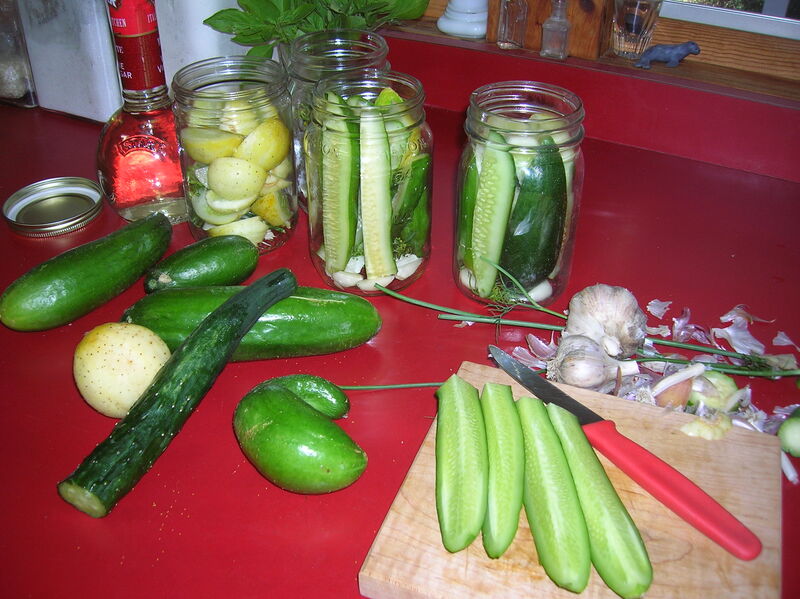 Pour liquid into jars to completely cover cucumbers. Screw on lids and place jars in refrigerator for two days. Enjoy your fresh and crunchy dill pickles! Combine the sugar, vinegar and salt, stirring until dissolved and stir in olive oil. Place sliced onions and cucumbers in a glass, plastic or ceramic bowl, and pour vinegar mixture over. Toss to coat vegetables and add peppercorns to taste (about a teaspoon). Cover and refrigerate overnight or eight hours to pickle. Mixture will keep, refrigerated, about a week. One of the joys of late summer is the seeing the beautiful wild staghorn sumac which “blooms’ with heads of fuzzy scarlet berries (drupes). This is not the poison sumac which produces white drupes, but rather staghorn sumac (R. typhina) which produces red drupes that can be used to make a tea or sumac-ade. 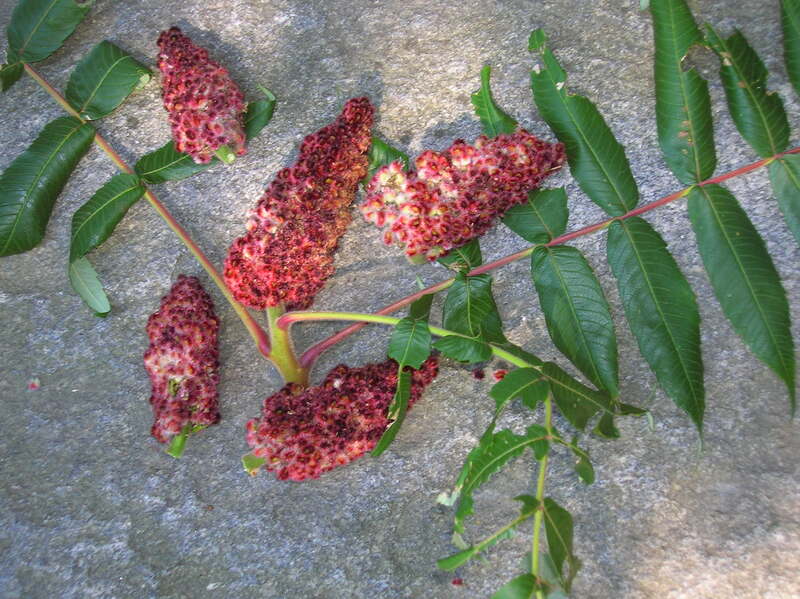 In Middle Eastern cultures the ripe fruit of a cousin of the staghorn sumac is dried, ground and used as a spice to add a lemony taste to meats, salads and other dishes, including hummus. And those sumac berries are often used as a garnish. 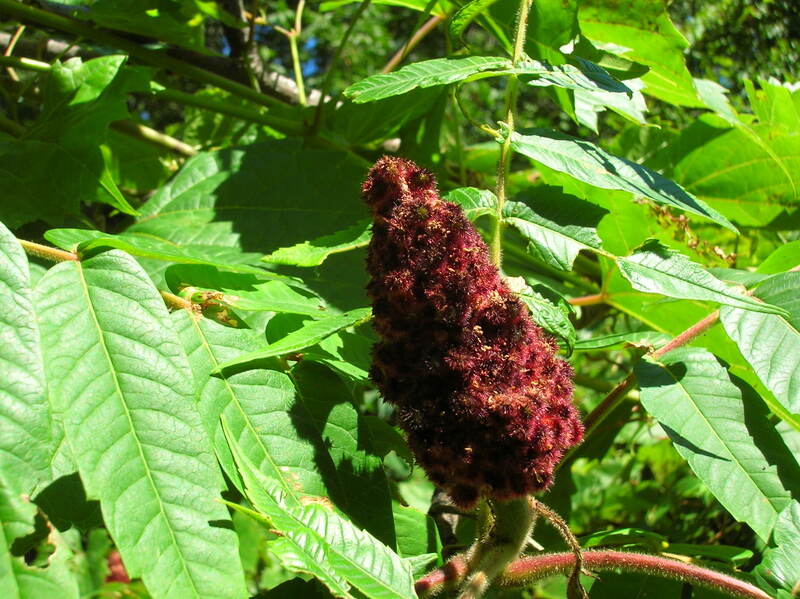 Staghorn sumac can be found growing in overgrown fields throughout the northeastern U.S. and southeastern Canada. It is a small tree or large shrub, usually eight to 20 feet tall, but can grow taller under certain conditions. As always, when gathering plant materials for consumption, be sure to positively identify the plant to be collected. Always get permission from property owners before collecting, and remember the “one-third” rule of collecting from the wild. Leave one third for wildlife, one third for future growth and take one third for yourself. To make sumac tea, place the heads of four or five fully-ripe sumac berries in a large container and crush slightly with a potato masher. Cover with a half gallon of cold water and let sit overnight. Because the berries or drupes are very fuzzy, you will need to filter the liquid through cheesecloth or a coffee filter the next day. Sweeten to taste with honey and enjoy the cranberry-like flavor and color. Serve cold, or over ice and enjoy.